See the complete 2009 NPFC-IFBB All States Amateur Bodybuilding Championships. The star competitors were Men’s Classic winner WES NEWELL, Men’s Under 80kg winner NICK JONES and Over 80kg winner GRAEME BENNETT. Of special note is Nick Jones’ IFBB debut. 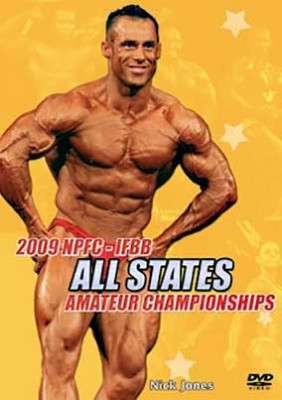 See the complete 2009 NPFC-IFBB All States Amateur Bodybuilding Championships for men and women. The star competitors were Men’s Classic winner WES NEWELL, Men’s Under 80kg winner NICK JONES and Over 80kg winner GRAEME BENNETT. All rounds are included from prejudging to posing routines and awards. Of special note Nick Jones has won major titles in almost every bodybuilding federation and this was his IFBB debut. Graeme Bennett has won major titles in the EFBB in UK. Also includes a superb Photo Gallery with 148 photos mostly by Robert Szabo, plus Pump Room footage. Other photos by Gary Phillips and Wayne Gallasch. An extra feature is seeing Pro Bench winner Shaun Bostock set a massive new All Time Australian Record of 325kgs @ 144.2kgs BW. This contest was held as part of the 2009 IFBB Pro Australian Grand Prix. 2009 NPFC-IFBB All States Amateur Championships Results. Dallas Brooks Hall, March 14th, 2009. Referees: Geoff Barclay (Bear), Charlie Coleiro, Frank Mormile.